I don’t remember agreeing to review In a Dog’s Heart, but when I received my review copy from the publisher, I was less than enthused. 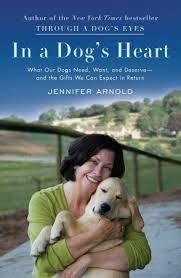 After briefly researching the author, I discovered that Jennifer Arnold is the founder of a non-profit that provides free guide dogs to people who need them but can’t afford them. While that’s certainly the kind of thing I’m into, I still dreaded reading this book, as I assumed it would be a somewhat cheesy and/or ridiculous book. Instead, it was extremely well researched and clearly written by an expert on the topic. I’ve owned dogs in the past, but will likely never do so again, and yet I was completely fascinated by much of the information in this book. Where I thought she would use generalizations, she really got into specifics. For example, when she’s talking about socializing a new puppy, she provides an extremely thorough and comprehensive list of different things to expose your puppy to, like children of various ages, men with hats and beards, people with packages, etc. There were a few things in this book that I already knew, but that she really dug deep and gave more information. There was a section on pet food that was particularly enlightening, as I thought I knew the dangers of certain types of food, but the details she gave were really thought-provoking. She also covers the domestication of dogs, and their evolution from wolves. Really, some very well written and fascinating stuff. I would absolutely recommend this book to someone who was thinking about getting a puppy, adopting a pet from a shelter, or that already has a dog. If I enjoyed it as a non-pet owner, I feel pretty confident that it would be an invaluable resource to people who are involved with pets. This entry was posted in book reviews, non-fiction and tagged arnold, book review, books. Bookmark the permalink.